This Wednesday, March 28th, a fundraiser for an unusual event is taking place. Head over to Big Snow Buffalo Lodge at 89 Varet St. in Bushwick to see PORCHES, New Atlantic Youth, I'm Turning Into..., Bermuda Bonnie, DJ Pete Fonda, a featured film by Heather Craig, and a mesmerizing dance performance by the Roadwork Dance Company. And if these phenomenal artists are somehow not enough to get you to what we think is one of the best venues in Bushwick, there will be free dinner served from 8-9pm, so don't be fashionably late (or you'll be fashionably hungry and disappointed in yourself.) Admission is $7-$15 sliding donation at the door. RSVP on Facebook here. But how does this show stand apart from the rest of the fabulous shows in our neighborhood? All of the proceeds are going towards funding the Vis-a-Vis Project, and 90% of that money goes directly to the artists participating. The Vis-a-Vis Project is a brand new festival unlike anything that has happened in Brooklyn, and exactly what it needs. The project will be happening in June, so stay tuned for more information about performers and artists as the date approaches. Below is an interview between myself and Rachael Pazdan, the founder and director of the project, and an all-around nifty chick. Explain Vis-a-Vis in one sentence. A cosmic make-out session in your parents basement between all DIY artists, collectives and spaces in Brooklyn. And how does Vis-a-Vis differ from the millions of other events held in Bushwick? Nothing like this has been done before here. It’s more than coming together for a party, show, or opening; it’s about cultivating local artists and exhibiting their work with monetary support behind it. We are attempting to bring together ALL arts collectives and groups that exist in Brooklyn + DIY space groups/owners to meet each other and talk about new ideas, collaborations, issues they face within DIY culture and how to resolve them. On the 3rd night, we are curating an interdisciplinary performance inviting over 20 collectives and artists in Brooklyn (dance, music, video art, film, spoken word, theater, etc.) who will collaborate and use audience interaction. We are using 93% of our budget to PAY all of these artists so that they may continue to create. What draws you to the DIY collective/venue scene? RP: While non-profit arts organization struggle to stay a float, DIY artists and venues in Brooklyn endure with the bare essentials. The work made is usually better than most things out there right now because of the innovation and creativity that goes behind creating work with essentially nothing, and performing or showing it in a space that is unusual, and sometimes limiting. It’s the attitude of “you can support us or not, you can pay attention or not, it will still be created and be more innovative than anything else out there”. I also am drawn to the sense of community and encouragement amongst the different spaces, artists and collectives in Brooklyn. What do you think the ultimate goal of Vis-a-Vis is? We want to bridge the gap between the more established collectives in Brooklyn who more or less pioneered the scene circa 2004/2005 with newer emerging spaces and collectives. I want them to meet and connect and collaborate. The second major goal is to create an atmosphere in this community that is ultra supportive of artists monetarily. We need to fundraise and pay these artists so that they can continue to create and be inspired, and I want to show that it’s possible! Lastly, I want to bring outside visibility to Brooklyn DIY artists by inviting people at BAM, people at City Center, The Kitchen, college professors, parents, students, and strangers to come experience the performance evening face to face (ahem…see definition: vis-à-vis). Have you heard of similar projects that have happened in the past? The Compendium, which was started by a few members including Ian Colletti who operates Vaudeville Park do a similar type of festival with curators and artists. But no, I haven’t heard of anything quite like this…fingers crossed! Do you think Vis-a-Vis will be a one-time thing, or will it grow into something bigger, like an annual event? The goal is to get this going twice a year! What aspect of the festival are you most excited for? I am excited for the lecture by a few of the members of Punk Drunk/Sleep No More to talk about creative producing at one of the talk back nights. I am also psyched to curate the performance night! It’s all amazing and we’ve had a lot of great support so far, I can only hope for that to grow as the time gets nearer to the festival! 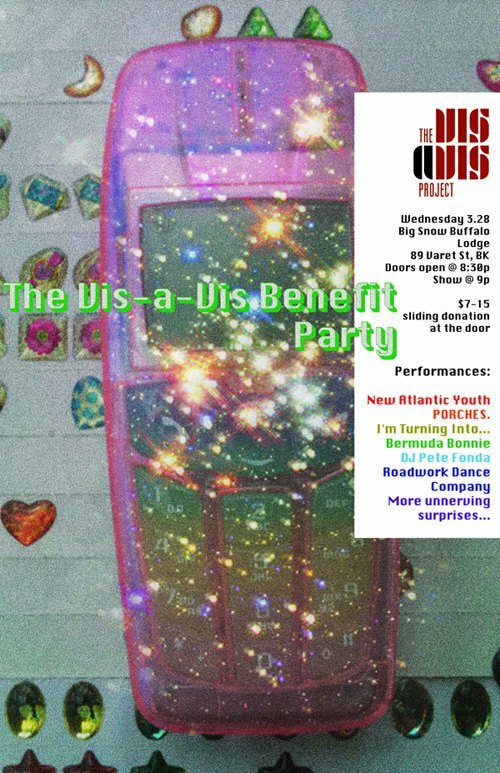 Benefit Party for the Vis-a-Vis Project is taking place this Wednesday at 8:30pm at Big Snow Buffalo Lodge. Admission is $7-$15 sliding donation at the door. RSVP on Facebook here.